Bellapierre Eye & Brow Complete Kit was put together to replace conventional eyebrow fillers and to shape your eyebrow with the exclusive Bellapierre tweezers provided. This simple 3 step system allows you to shape your eyebrows, fill your brows, and paint on your liquid eyeliner. The colors are made with our famous 100% Mineral Powders. Together with our easy to use angled brush and clear mascara create the ultimate brow grooming. This kit includes full instructions and tips. Eyebrows help shape our face and have a dramatic impact on the way that our eyes are defined. They have the ability to make our eyes looks smaller or larger, and with Bellapierre Mineral Powders you are able to fill the brows with color and intensify your eyes for an attractive and subtle look. Available in Ginger Blonde, Marrone, and Noir. Mica (CI 77019), Titanium Dioxide (CI 77891). May contain: Iron Oxides, Methicone, Ultramarines. Candelilla Cera (Candelilla Wax), Copernicia Cerifera Cera (Carnauba Wax), Cera Alba (Beeswax), Rhus Succedanea Cera (Japanese Wax), Ricinus Communis (Castor) Seed Oil, Butyrospermum Parkii (Shea Butter), Ascrobyl Palmitate, Simmondsia Chinensis (Jojoba) Seed Oil, Carthamus Tinctorius Oil, Tocopheryl Acetate (Vitamin E), Pentaerythrithyl Tetrastearate, Persea Gratissma (Avocado) Oil. May contain: Iron Oxides [+/- CI 77891, CI 77007, CI 77019, CI 77491, CI 77492, CI 77499, CI 77742, CI 77266]. First, using the Bellapierre tweezers provided remove any stray hairs that are not in line with your brow. Make sure you do not over pluck the brow as you still want to keep a natural brow look. 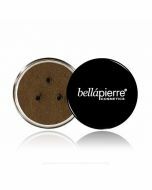 After the brow has been shaped, tap a small amount of the Bellapierre shimmer shade into the lid of the shimmer container. Then swirl the Brow/Liner Brush into the lid until the desired amount of minerals are absorbed into the tapers of the brush. 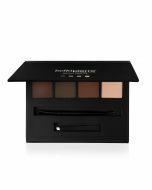 With soft light strokes fill in your natural brow shape. Start at the arch of the brow near the corner of your eye, moving along the brow to finish at the end. Finish off the natural look by applying Bellapierre Clear Mascara to set the lashes and to achieve an all-day naturally polished look. Tap a small amount of the Bellapierre Shimmer into the lid of the shimmer container, and then add 2 or 3 small drops of water to turn the powder into a paste. 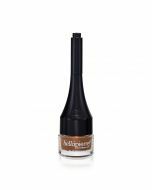 With your Bellapierre Brow/Liner brush, mix the water and mineral shimmer powder in the container lid using it as a palette to create a thin paste, and add more water if needed. Using the brush provided, glide it along the lash line starting at the outer corner working your way to the edge of the eye lid to create a defined line. In order to line the lower eye lid, use the same method above. Draw a light line, moving from the outside edge working your way inwards. Your line should be slightly thicker at the outside corner, becoming thinner as it moves in towards your nose. Follow the shape of your eye for a natural look!